Sail Far Live Free - Relent to Water Wanderlust! : Boat U.S. Towing Insurance...Get it now! Boat U.S. Towing Insurance...Get it now! Being thus arrived in a good harbor, and brought safe to land, they fell upon their knees and blessed the God of Heaven who had brought them over the vast and furious ocean, and delivered them from all the perils and miseries thereof, again to set their feet on the firm and stable earth, their proper element. -William Bradford from Of Pilgrims Plantation (1650) describing the arrival of the Pilgrims in Massachusetts in 1620. 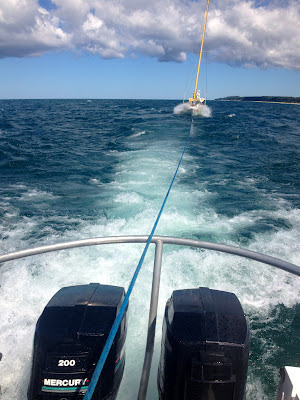 We just got back from our 310 nautical mile cruise to Wisconsin's Door County peninsula. I've got plenty of new material to post from the trip (coming soon! ), but for now, I just wanted to give a quick plug for Boat U.S. Towing Insurance. I've had the insurance for 3 years and have had the "opportunity" to use the service twice when we've had engine failures. Needless to say, the towing insurance has paid for itself many times over. Today we we're towed back to Muskegon when we had ignition issues with our little Volvo motor. The waves on Lake Michigan were right on our bow and made for an unpleasant ~4 hour ride, but we made it safe and sound thanks to Boat U.S. Towing services. I was told that our tow today would have cost us over $2,000 if we didn't have the insurance. The moral of the story? Get you Boat U.S. membership and towing insurance today! Not intending any ill will here, and with all the deserved respect to Boat US that they deserve ... why didn't / couldn't you sail back? DR - Great question! We 3 miles offshore on Lake Michigan and 25 miles from port when our motor died and the wind died. When the wind finally did pick up, it was right on our nose. We were already 2 days overdue on our return because of weather related issues and we thought it best to get our 5 month old daughter off the water. True, we could have sailed downwind (further from our homeport and repairs), but we had commitments back at home we couldn't miss.